Good morning from the neighborhood of San Blas in Cusco, Peru! Today begins programming in my four-month artist residency at Healing House, which is a center offering courses and services as well as an intentional community. 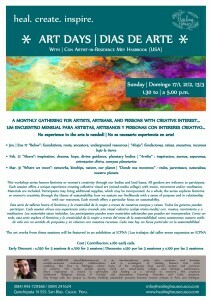 I’m looking forward to kicking off our monthly Art Days! We begin with the first of three workshops, “Below“, followed by an open studio for participants to co-create. Today doubles as the launch of Healing House’s new residency program, which I have taken a real pleasure in co-designing with staff and Founder/ Director Niki Coates. A main goal is to expand connecting with the arts community and persons with creative interest. As with all new things, outreach is an important step in making contact. In the residency collaboration with Healing House and the intercultural agency ICPNA Cusco, I bring my project La Puenta to bridge sustainable arts between women in Peru and Michigan. Since arriving to Peru a second time in early December, I have been meeting new artisans in the area of Cusco. As part of my residency, I will have an exhibition in April and am exploring possibilities to commission materials and/or works from various artisans — new and ones I met on my last journey. So there’s a full day ahead! Photos and stories are around the corner. As always, thanks for your interest and support. And about things to come: News is in development about sharing my journey and showing this year’s art work when I get back to Michigan. So please stay tuned. You can also find news on my Facebook artist page. Blessings! 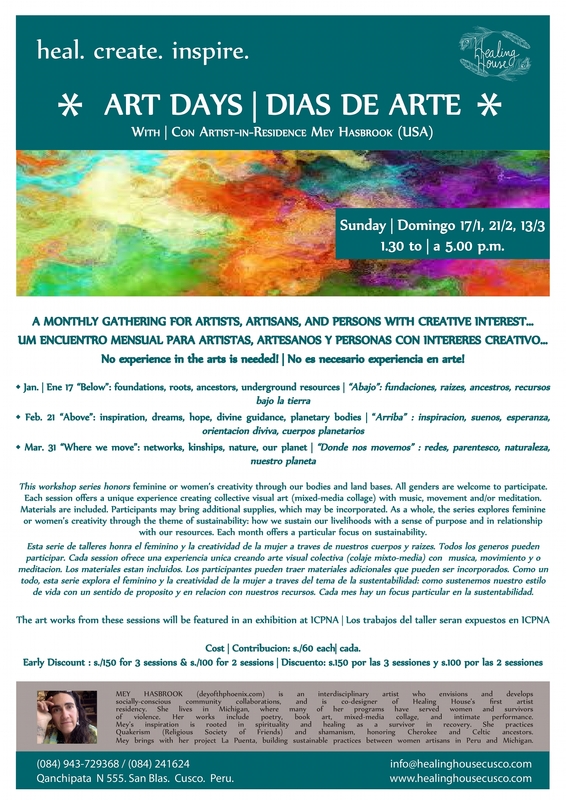 This entry was posted in Uncategorized and tagged Art Days, artist residency, Cusco, Healing House, ICPNA Cusco, La Puenta, Niki Coates, open studio, women artisan, workshop. Bookmark the permalink.